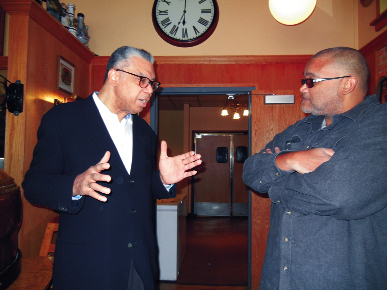 MARQUETTE — Michigan gubernatorial candidate Bill Cobbs, representing the Democratic Party, talked about his platform on Saturday at a meet-and-greet at the Vierling Restaurant and Marquette Harbor Brewery. Cobbs, 63, of Farmington Hills, is a former executive for the Xerox Corp. Saturday marked his first trip to the Upper Peninsula during this campaign cycle. “I fundamentally believe that citizens in the state of Michigan aren’t given a fair shake,” Cobbs said. Cobbs served with the U.S. Navy. His employment includes serving as a police officer and working his way up from a stock boy in a Detroit clothing store to a global vice president of Xerox, a Fortune 500 company. After holding other business leadership positions, Cobbs, who now is retired, became engaged in the political process in Michigan about six years ago when he began to see some of the things that were happening. About two years ago, he started to think about the need for someone who had a different perspective to run for governor. “Last year, I just said, ‘You’ve got to do it,’ because I didn’t like the way things went in the 2016 elections,” Cobbs said. There are four primary points in his platform. He also said he would deploy a major statewide infrastructure replacement and repair program. “Third thing is, we need a fair tax policy, a tax policy that’s fair to the citizens and forces corporations and big companies to pay their fair share,” Cobbs said. The last point deals with water and an environmental policy. He expressed concern over the Trump administration’s potential massive cuts to the Great Lakes Restoration Initiative. The GLRI combats invasive species and restores fish and wildlife habitat, among other goals. The Detroit Free Press had reported the reduction to be from $300 million annually to about $10 million. “When you defund it to the extent that 97 percent of that money goes away, that’s nuts,” Cobbs said. For example, the fishing industry in the United States would be adversely affected when invasive species are brought into the country from international waters, he said. One of the Vierling visitors with whom Cobbs spoke was John Stewart of Marquette, who said he volunteers mainly at the county political level. However, he said he would volunteer for Cobbs. The Michigan gubernatorial election is set for Nov. 6, 2018. Christie Bleck can be reached at 906-228-2500, ext. 250. Her email address is cbleck@miningjournal.net.